PITTSBURGH -- The sluggish opening three months. The so-so finish. The only occasional attention to detail on defense. None of it matters anymore. Sidney Crosby and the Penguins provided proof in Pittsburgh's 7-0 dismantling of the Philadelphia Flyers in the opening game of their first-round series Wednesday night. Not that Pittsburgh's captain wanted to buy into any sort of message sending, even after the Penguins became only the fifth team in NHL history to win a series opener by at least seven goals. 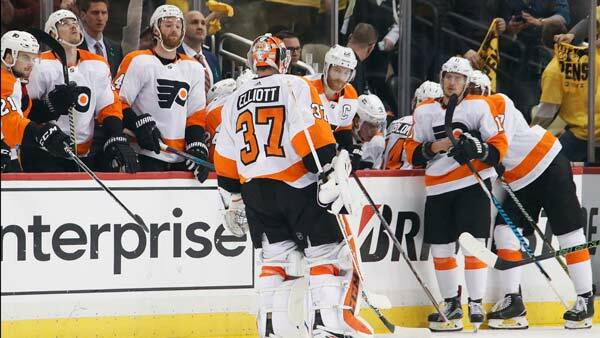 Whoever is in net for the Flyers, it won't matter if the play in front of them isn't better. Philadelphia's power play went 0 for 4 and didn't even generate a shot. "They beat us from pretty much every aspect tonight, starting from the net out," Elliott said. "Everybody just has to be better." The Flyers stressed the need to stay out of the penalty box and put together three disciplined, competitive periods if they wanted to put an abrupt halt to Pittsburgh's run at history. It didn't happen. Not even close. The Penguins jumped on Philadelphia early. Elliott stopped Kris Letang's slap shot with his blocker only to see the long rebound go right to Rust, who ripped it over Elliott's right shoulder to give the Penguins the lead 2:38 into the game. Philadelphia's best chance at staying in it came minutes later, but Scott Laughton whiffed on his first attempt from the doorstep and Murray made a sprawling glove save on Laughton's second try to preserve Pittsburgh's lead. "If that goes in, it's 1-1 and maybe we're talking about a different result," Crosby said. Moments later, Hagelin expertly redirected Patric Hornqvist's shot past Elliott 10:07 into the game. Malkin drew a hooking penalty to negate a Pittsburgh power play, and when he emerged from the penalty box, he whizzed past three Flyers in one sequence, darting by Jakub Voracek, slipping past Giroux and then fending off Shayne Gostisbehere before flicking a backhand past Elliott to put the Penguins up 3-0 before the series was 15 minutes old. The two-time MVP has a knack for scoring in unorthodox ways. He beat Montreal's Carey Price with an intentional double-deflection and smacked a rebound out of air in overtime to top New Jersey within a span of eight days last month. NOTES: Crosby's hat trick tied Pittsburgh owner and Hall of Famer Mario Lemieux for the most postseason hat tricks in franchise history. ... Murray hasn't allowed a goal since Game 4 of the 2017 Stanley Cup finals, a span of 206:26. ... The Penguins, who had the league's top-ranked power play during the regular season, went 1 for 4 with the man advantage. ... Pittsburgh C Derick Brassard, who missed time late in the regular season with a lower-body injury, had an assist in 13:44. ... Injured Steelers LB Ryan Shazier, who is recovering from spine stabilization surgery and has already been ruled out for the 2018 season, stood up and led the sell-out crowd in a pre-game cheer.